Galvanising is a very effective method of preventing steel from corroding when used outdoors. The work to be protected is immersed in a bath of molten zinc which reacts with the surface of the steel, coating it with a thick durable layer of zinc. This coating is said to be "sacrificial" since the zinc will slowly corrode away, whilst electrochemically preventing the steel from corroding. In normal circumstances it can offer decades of protection. We have all our exterior steel work galvanised as a matter of course. Galvanised steel has an attractive metallic appearance which is often used as an exterior finish. When fresh it has a shiny silver appearance, though this will slowly turn dull grey over a few years. Because galvanising is a industrial process, its finish can be rather variable. Usually it is smooth and shiny but some areas may have a rougher dull grey finish. 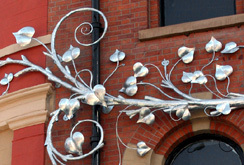 Also, fine detail is often masked by the zinc coating. Galvanised steel can be painted but special vinyl paints must be used; conventional paint does not adhere well to a galvanised finish. Prior to painting, the zinc coating is often artificially aged with an acid to provide a better key for the paint to stick to. This turns the zinc a mottled grey black and is often used just to cosmetically age galvanised steel. Often galvanised steel is painted using powder coating. However, we do not recommend this since although it may look good initially, powder coating is notoriously bad at sticking to galvanised steel and will drop of in very large flakes over the course of a year or so. Since hot dipping floods and masks fine detail, an alternative is to spray molten zinc metal onto the steel. This method is equally as effective at preventing corrosion where the spary can reach but it will not reach inside hollow box section steel. Additionally, the finish is micro-porous and cannot be left "as is"; it needs to be painted to obtain the maximum protection.